Good choice because this set design is worthy of a crime. Indeed Dayf, the Goggles Do Nothing!, which is something I must rectify. I spent a few days casually thinking of how to tone this set down. I thought of taking the ’88 Score approach and turning the design into a rainbow, but that seemed a bit cliché. 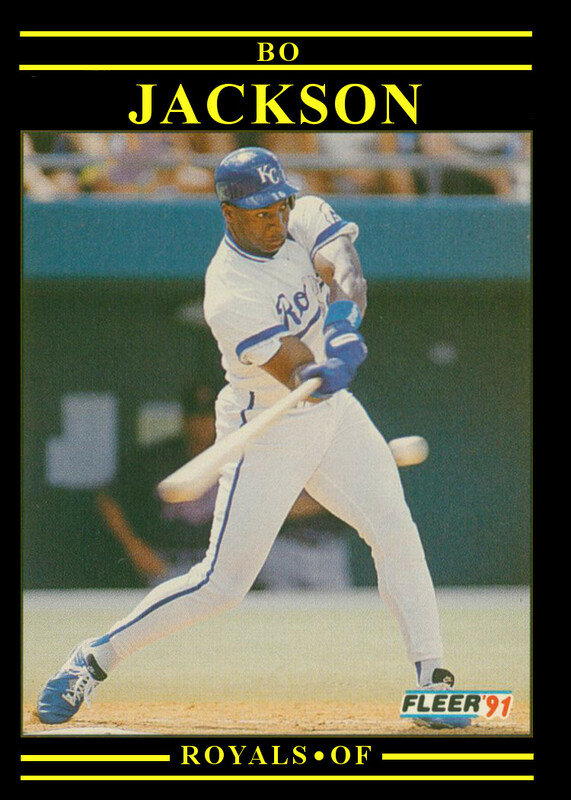 I next thought of somehow combining the barf fest that is 1995 Fleer into the 1991 Fleer design to kill two birds with one stone, but I decided my retinas and/or the internets would a’splode into a garbled mess of nineties-ness. So, I took a step back and just looked at the front of the card, and asked myself what is right and what is wrong with this card. Obviously, the wrong part is the yellow, but the rest of the card seemed ok. I like the bars framing the name and team/position, the photography is fine and the black text is acceptable. Then, in a moment of a Bowman designer’s inspiration I thought, “Let’s invert the color scheme!” Instead of black on yellow, how about yellow on black? A quick session of photoshop revealed that yellow on black is not bad, much more pleasing to the eyes. As far as I can tell, it’s not blatantly ripping off another design, and the entire Pittsburgh sports trifecta works the yellow and black pretty well, so I decided to roll with it. Enjoy the revamped 1991 Fleer design, and you can take the goggles off now. It would have been very Fleer-like to have the black with a team color. i.e. blue writing for Bo's Royals, orange for the Orioles, red for the Cardinals ,etc. Yes, get rid of the yellow all together! very cool looking card. nice, simple idea.